Sonoma Valley Vintners and Growers Alliance threw out a challenge to its members on January 17 to become the first 100% sustainable region in Sonoma County. Their members have responded with enthusiasm, resulting in the largest AVA participation at the California Sustainable Winegrowing Alliance’s workshops in the past 6 months. Encompassing 5 AVA’s, including Sonoma Mountain, Los Carneros, Moon Mountain District, and Bennett Valley, Sonoma Valley is one of Sonoma County’s largest regions with approximately 13,400 acres planted to wine grapes. Bennett Valley AVA recently put their own stake in the ground with a plan in place to become Sonoma County’s first 100% certified sustainable AVA by 2017. The Bennett Valley Grape Growers Association recently appointed respected vineyard manager Chris Bowland to a new sustainability coordinator position on their board of directors to provide more resources and help guide their growers towards sustainability. With just over 650 planted acres, Bennett Valley has 36 primarily family-owned vineyards that average around 20 acres each. Bowland manages many of the vineyards in this region and is currently in the process of getting his vineyard management operations certified under the California Code of Sustainable Winegrowing Alliance program, which would make the process of assessment and certification more seamless for his clients in the area. The Winegrowers of Dry Creek Valley, an association representing 150 growers and 65 wineries of which more than 95% are small, family-owned within Dry Creek Valley AVA, has created a sustainability committee for their region. Additionally, they appointed 3rd generation winegrower David Mounts as chair to help lead their efforts towards becoming 100% sustainable by 2019. The Alexander Valley Winegrowers Association kicked off their sustainability initiative planning process at their Annual Meeting on July 16. Sonoma County Winegrowers’ Sustainability Manager Robert LaVine presented an overview of the sustainability program to help winegrowers in that AVA get started on their self-assessment and certification. Although many of the region’s multigenerational wine growers and winemakers have been practicing sustainable farming techniques and winemaking practices for decades, the unprecedented industry involvement demonstrates their seriousness and commitment to ensuring all vineyards and wineries across Sonoma County will soon be sustainable. This commitment by a wine region is a remarkable collaboration of the 1,800 growers, 650 wineries, and 16 AVAs in Sonoma County working toward one goal – ensuring that the land stays preserved in agriculture, their community of neighbors and workers are treated with respect, and their business endures, providing positive economic impact to Sonoma County. 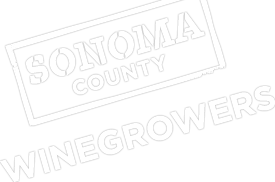 The Sonoma County Winegrape Commission, also known as Sonoma County Winegrowers, is a marketing and education organization dedicated to the promotion and preservation of Sonoma County as one of the world’s premier grape growing regions. SCW has oversight by California Department of Food and Agriculture which supports producer regions. With more than 1,800 growers, SCW’s goal is to increase awareness and recognition of the quality and diversity of Sonoma County’s grapes and wines through dynamic marketing and educational programs targeted to wine consumers around the world. In January 2014, SCW committed to becoming the nation’s first 100% sustainable winegrowing region by 2019. For more information about SCWC and its programs, visit www.sonomawinegrape.org.